In other news, Sydney went to her school's girl's choice dance last night. I really don't like the name of that dance. I wish it was called Sadie Hawkins or MORP or something nice. Dog Patch is a terrible name. Maybe there is a great story with a fabulous meaning behind it that I just don't know, but even if that were the case I'd still think it's a bad name for a girl's choice dance. 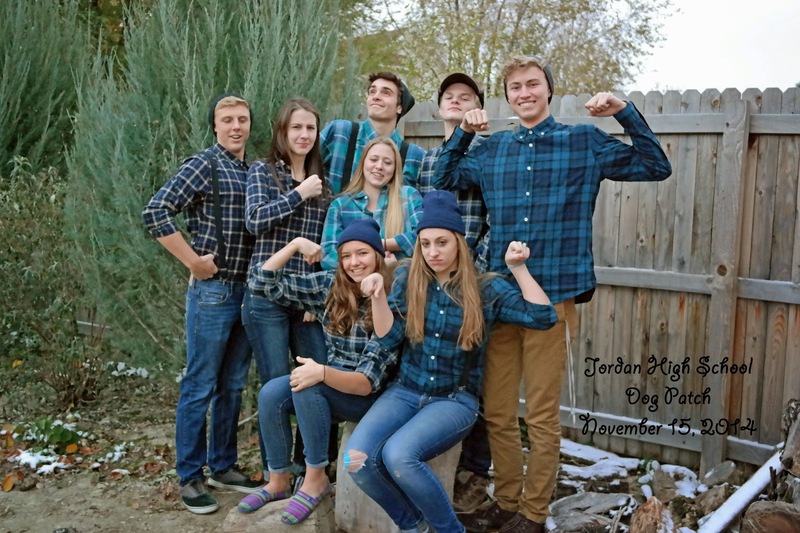 Ok, now that my little rant is over, Syd and her date & their group dressed as lumberjacks and they had a great time. I was able to take their pictures outside in the freezing cold. They loved it! They were super excited when I kept saying, "Wait, one more!" Gretchen's big news is that she was asked to play the piano for the youth session of stake conference. It was this morning and she was awesome. She was so nervous! Who could blame her? It's not every day that you play the piano in front of an apostle and have 200 people sing along. She has been practicing for a month so I'm happy it turned out well. I think I might have been just as nervous as her. My last piece of news is that I've settled on a date for my annual studio open house. Saturday December 13 from 1:00-4:00pm. I have been quite busy in the studio. I'll be posting new pottery pics later this week. Pretty exciting!